How do I detect a gas leak? There are several signs that can indicate a gas leak is present. If you see any of these signs, please notify NW Natural immediately at 1-800-822-3377. They can confirm if there is a leak and take the right steps to make the situation safe. Call us next at 503-395-4997 and we’ll get your gas line repair taken care of ASAP. What to do when you suspect a gas leak from your gas piping? The first thing to do is leave the building. Leave everything as is, even your gas line turned on. Do not turn it off or on. For safety reasons do not do anything that may cause a spark such as turning off or on any of your electrical appliances or electronic gadgets. Call NW Natural immediately at 1-800-822-3377 from outside the building or somewhere else. Why is it important to know where your gas pipes are? You might accidentally break a gas line or other underground service while digging in your yard. Careless digging cannot only damage and disrupt vital utility services but can cause injury or even loss of life. Make sure that any service professionals doing work are aware of your gas lines location and additionally make sure that your gas lines are clearly marked if it’s an underground gas line installation. If a gas line break occurs, go to a safe location and immediately call NW Natural at 1-800-822-3377, then call us and we’ll get your repair scheduled right away. Why is it not safe to hang anything on gas pipes? Overhead natural gas pipes may seem like an ideal place to hang clothes or other items, but the weight of these items could damage the gas pipe and cause a leak. Never hang anything from a gas line. What to do when snow and ice accumulate in the gas pipes? Remove large icicles hanging over meter assemblies and appliance vents. Make sure whoever removes snow from your property is aware of its location. Use a broom—not a shovel—to clear snow from your gas meter assembly and vents. Why do I need to keep the exterior sidewall vents clear? Beware of exhaust getting trapped by snow around a sidewall vent. If a vent becomes buried in snow or blocked otherwise, this may shut down your equipment – or draw exhaust fumes into your home, which can produce high levels of CO inside your house that is hazardous to health. Why do I need an expert to do the gas piping? 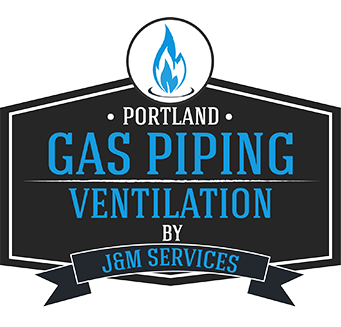 You need an expert like Portland Gas Piping and Ventilation to ensure a risk-free gas pipe installation or gas line repair in your home or establishment. Although we have come across many customers who have done DIY gas piping, we strongly suggest that you leave it to professionals like us. Not only is there a potential risk to your safety, but in the event of a future issue, it may not be covered by your home owner’s policy if the work was not properly done. 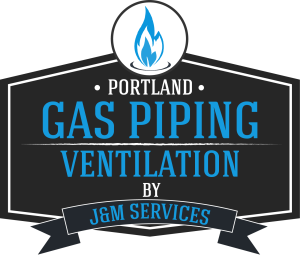 Don’t take the chance with your home’s safety, call Portland Gas Piping and Ventilation today. Smell Gas? If so, you should call NW Natural (1-800-882-3377)! They will come out, assess the danger and tag the leak, which speeds up the process when we arrive.